French-Canadian firefighter Darren McCord (Jean-Claude Van Damme) has retired from his career following a traumatic experience, and now works as a fire marshal for the Pittsburg Civic Arena. When the Stanley Cup Final is invaded by a group of criminals, and the Vice-President (Raymond J. Barry) held hostage by former CIA operative Joshua Foss (Powers Boothe), McCord is the only man in the position to save the day. Peter Hyams is a weird king of functional but unimpressive cinema. He boasts a long career filled with competently staged and directed action films and thrillers, including Capricorn One, Outland, 2010, The Presidio, Narrow Margin, The Relic and Time Cop. I’m not sure he has ever directed and out-and-out awful picture, although his 2001 swashbuckler The Musketeer comes perilously close, but at the same time I’d be hard-pressed to name one of his films that was actively great either. His entire oeuvre simply sits there, glimmering here and there but more often than not resembling a correctly assembled piece of flat-packed Swedish furniture. Sudden Death is a perfect representative of a Peter Hyams movie. It has a fairly derivative story in the mold of Die Hard – one everyday hero against an army of machine gun-toting criminals – but it does find a fresh setting in which to stage it. There are a number of broadly effective and violent fight sequences. Like all half-decent action films, it knows that the most entertaining character is the villain and casts appropriately. Powers Boothe clearly knows what kind of a film he is in, and hams up the performance levels appropriately. Similarly, the film knows to cast a respectable character actor as the Vice-President: Raymond J. Barry wisely plays things nobly and with dignity. Jean-Claude Van Damme is, like most action stars of his generation, a relatively limited and poor actor. He slips into the role of firefighter Darren McCord about as awkwardly as one can imagine: the script caters for Van Damme to the extent of making his character French-Canadian – which at least explains his Belgian accent – but it does not go so far as to give him a remotely French-sounding name. He works his way through the film with a remarkable earnest quality, but its an earnestness that falls flat at every turn. He is entirely unconvincing as a father, although the screenplay does neither him nor his juvenile co-stars any favours. Here and there, however, you see that Hyams glimmer. Sudden Death works in its little moments and highlights. There’s a particularly well-staged and brutal kitchen fight. Even better, there’s a violent punch-up to the death between McCord and a hockey mascot in a giant penguin costume. By the time the film gets McCord onto the ice in the middle of a hockey game disguised as a goal keeper, it becomes blatantly apparent that there’s a tongue in cheek approach to the whole enterprise. The makers of Sudden Death – Hyams, Van Damme, Boothe, and so on – are under no illusions of what they are making. They know it’s derivative and by-the-numbers. They also know that it’s okay. It’s okay to enjoy middle-of-the-road entertainment. It’s not so much ‘turn off the brain’ stuff, but it is relaxing, familiar, comfort viewing. As viewers we don’t need to be taxed or challenged by every movie. We don’t need unexpected and dramatic twists and surprises. It’s okay just to make a fun, conventional action film. 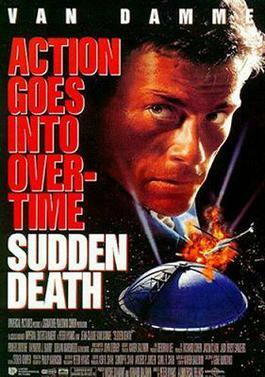 Every few years I pull Sudden Death and give it a fresh viewing, because it’s ultimately just a fun, silly action flick. It’s got just enough glimmering in there to stand out from the pack.